Cats make a house a home but litter box smell can make home life nothing but strife. Litter box issues can spring from a variety of issues. If your vet has ruled out physical or emotional problems and the box is kept clean and accessible, Litter Getter might help attract your cat to the box — and not the carpet or bed. Sprinkle some Litter Getter on top of the litter and the scent promises to attract cats to the box. This can be particularly helpful for blind or elderly cats. The all-natural ingredients include herbs mixed with soy oil and rosemary extract. According to the company’s website, they were inspired by Jackson, a blind cat. Jackson’s progressive loss of sight made it difficult for him to find the litter box. So his family eventually created a product that helped not only Jackson — but cats everywhere. We were intrigued, so we wanted to try Litter Getter with Stanni and Lennie. First off, the granules had a vaguely grassy scent that blended nicely with the pine litter. We did consider the very detailed directions a bit of overkill. Just open the container and add a dusting on top of the litter and lightly mix it in. Now, the real test. What would Stanni and Lennie do? Stanni picked up the scent immediately. She marched over to the box, sniffed intently and walked away. Maybe she was simply processing the smell but 2 minutes later she was in the box. She didn’t seem to love it or hate it but Litter Getter got her attention. She had the same reaction on Day 2. So by that standard, Litter Getter works. Lennie seemed to react like a typical young male. The scent attracted him pretty quickly but his first reaction was to sniff, dig and kick litter all over the bathroom. He seemed quite proud of himself. It neither attracted him nor repelled him from the box. Our take: Litter Getter can be an effective way to draw elderly or sick cats to the box and we endorse any product that helps seniors. The ingredients are natural but check with your vet to make sure your cat doesn’t have any issues with any ingredient. Watch the video below to see Litter Getter in action as Aries the cat gives his review. 1. Scoop the box daily or more. 2. Replace the litter twice a week. 3. Replace the litter box once a year. 5. Find a brand of litter that smells best to you (and your cat). 6. Keep the litter box in a well-ventilated area. We would like to add our own thoughts to No. 5. Heavily-scented clay litters can aggravate breathing issues for your or your cat. While we believe the cat always wins when it comes to choosing the litter, always consider natural products such as pine or wheat-based litter. Better for your cat; better for everyone’s health and environment. 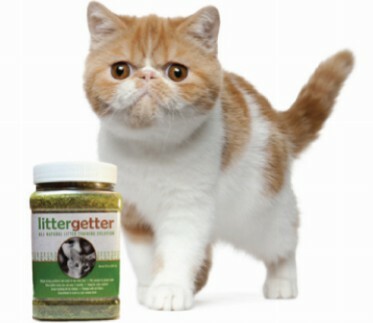 Please leave a comment if you have used Litter Getter or any “litter training” product. We’d love to know what you think.